Sita is a Beneteau First 45f5, one of Beneteau’s most successful models, designed by Bruce Farr and Pininfarina and hailed as a near perfect blend of form and function. The design was way ahead of its time and Sita looks as good today as many of her more modern contemporaries. However, being a bit more solidly built, she is much more secure in heavy weather and stands the test of time much more successfully. Guests’ sleeping accommodation is in three well appointed cabins; a large, double berth master cabin in the bow with en-suite shower and toilet; and two spacious, double berth cabins in the stern that share a shower/toilet, which is accessed from the saloon. The saloon table can seat six in comfort with plenty of room for more and the longitudinal galley area has loads of space for food preparation, cooking and washing up. 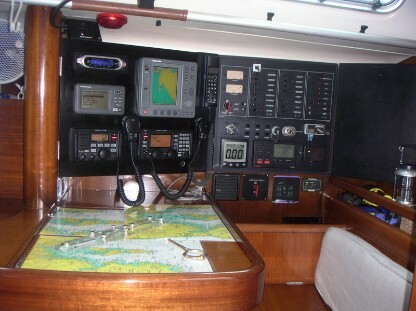 The cockpit has a folding table for al fresco dining and has plenty room for relaxing, it’s comfortable for sailing and being of a more traditional design, it feels much more secure than those on many modern boats. There is a large swim platform on the transom with lockers for snorkeling gear, a fresh water shower and a telescopic boarding ladder. Built in 1990, Sita's extensive re-fit was completed in 2006, with new standing rigging, new engine, new instruments, many cruising modifications and a host of other additions and replacements. She is probably one of the best equipped boats of her type in the marina and with her modern, curvaceous good looks, she captures many an admiring gaze. 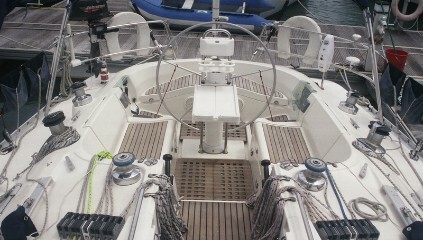 A fractional rig with swept back spreaders; a coach-roof mainsheet traveler and all lines led back to the cockpit means that Sita is an easy boat to handle. No running backstays or checkstays to worry about; a deep, solid lead keel for good pointing ability and directional stability; and a sail area to displacement ratio that puts her in the performance cruiser class. 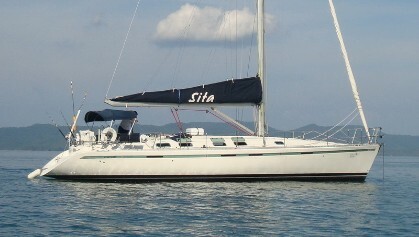 Sita is a high spec, comfortable cruiser that does well in light airs and on the race course.